If you’re wanting to be in possession of a car that you can drive whenever you want, you have two main options: buying or leasing. Coming to a decision about which way to go is the smartest approach confuses a lot of people, so we’ve put together this page in order to help you make the right choice. Buying a new car fresh off a lot allows you to have the comfort of knowing that the car you’re driving is yours – at least after it’s paid off. Before then, it’s actually a car that’s owned by the bank or other lender that financed your purchase. Run into some bad luck, miss a payment or two, and the repo man may well show up and take the car back, leaving you bereft of all the money you’d paid in already, including the huge down-payments that are typically involved. When things go wrong with that car, it’s your problem to deal with aside from a few things that any warranty might cover. And then there are the other problems that come with purchasing rather than leasing. For ex., when you buy, you’re pretty much stuck with that purchase, in the situation of missing out on all the latest, important safety features that’ve been developed since you bought your car. You’d be missing out, too, on all the most recent technological gadgets that make driving more fun. And then, when you’ve reached the point where you’re wanting to get rid of your bought car so you can get a newer model, you’re stuck having to sell that car – a car that depreciated in value the moment you drove it off the lot. That last can’t be stressed enough: as soon as you drive your newly purchased car off the seller’s lot, it’s worth a percentage of what you paid for it. Add in the number of years you’ve owned that car, and you’ll end up being able to sell it for only a fraction of its original or even true value. When you lease, though, you’ll always be driving a brand new model car with all the latest safety enhancements and technological gizmos. You’re never stuck having to sell that car, either. All you have to do to start to drive an even newer model is trade it in, and there are a number of ways to go about doing that, including allowing your leasing contract to die “naturally” per the terms of the lease, exiting your lease early, entering into a lease transfer arrangement, and so forth – each option being something we’d help you with every step of the way. Bottom line: when you lease, you can always be driving a new model car that jibes with your changing lifestyle and evolving interests, but you’ll have a fraction of the responsibilities and negative consequences that are aspects of purchasing a car outright. Once you’ve come to the decision to lease, though, you’ll have to figure out which is the right company to lease from. If inventory variety, low prices, convenience, and customer service are things that are important to you, then leasing from us is the right choice. Read on to learn why! When it comes to a varied inventory of vehicles to choose from, we’re the best. Talk’s cheap, but we can back it up, we promise. Unlike other car leasing agencies that offer only a few models of vehicles made by a small number of car manufacturers, we’re able to offer you any new model vehicle made by Acura, Audi, BMW, Buick, Cadillac, Chevrolet, Chrysler, Dodge, Ford, Honda, Hyundai, Infiniti, Jaguar, Jeep, Kia, Land Rover, Lexus, Maserati, Mazda, Mercedes-Benz, MINI, Mitsubishi, Nissan, Porsche, Ram, Subaru, Smart, Toyota, Volkswagen, or Volvo. Coupes, sedans, convertibles, vans, minivans, trucks, SUVs and other off-road vehicles – no matter the type of vehicle you’re wanting, no matter what brand of vehicle you’re wanting, the odds are we’ve got what you’re looking for. 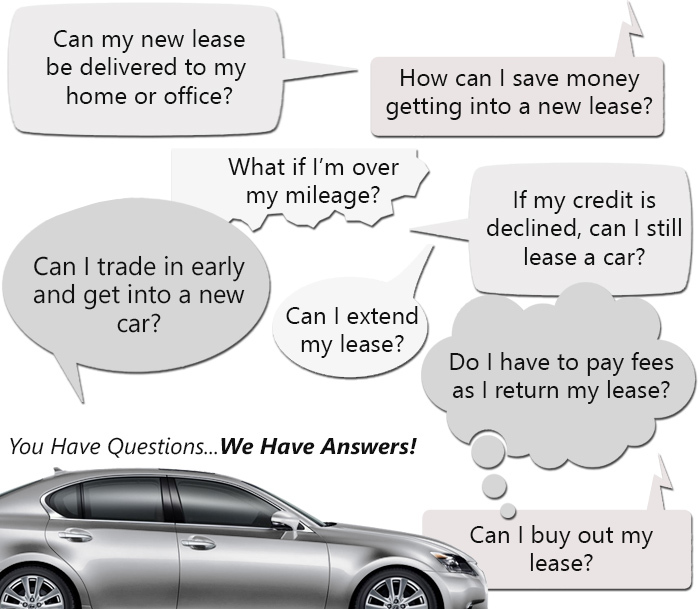 Why don’t other car leasing services have that sort of inventory? Because they have nowhere to park all those vehicles, that’s why. That may sound silly, but it’s so. Those companies have physical car lots, with only so many parking spots. They’re limited inventory-wise by their very model of doing business. We, on the other hand, don’t have a physical car lot; we have a virtual one instead, a lot that sits on the internet and is always the exactly right, perfect size to allow us to offer any new model car made by just about any car manufacturer you can think of. Our vehicles aren’t few in number, aren’t getting sun-beaten and rained on in some parking lot; they’re on the internet, ready for you to look at any time you want. Having a virtual car lot doesn’t just allow us to have the largest inventory around; it also allows us to offer you our vehicles at the lowest possible prices. Those old-school parking lots cost a lot of money, you see. Property costs, property taxes, utilities, insurance, payroll for the folks who staff the place – all of these costs add up to make for a large overhead, and, trust us, those car leasing companies aren’t paying for that large overhead themselves. They raise their prices so you pay for it. Because we don’t have that sort of high overhead, we can keep our prices lower – a lot lower -- than our competitors can! The great things about having a virtual car lot don’t end with the ability to have the biggest inventory and lowest prices around; it also allows our customers to have the ultimate car leasing experience. You won’t have to find a ride so you can get to some car lot somewhere, and you won’t be followed around that lot by some annoying salesman who’ll jibber-jabber in your ear the whole time, trying to get you to lease something, anything, as quickly as possible so he can collect his commission and get on with lunch. Instead, you get to stay in your own cozy home and do your car shopping from your favorite comfy-chair. Any day of the week, any time of the day or night. No pressure, no feeling rushed along. If you’re a night person, no business hours will stand in your way of car shopping while you’re wide awake and raring to go. You can take friends and family along with you by emailing to them cars that interest you, so you can get their opinions as to which one would be the best choice for you. Bookmark cars as you go along so you can come back later and compare those bookmarks more closely with each other. The car shopping experience centers on you, not the needs of some manager or salesman. If you have any questions as you go along, you obviously can’t turn around and ask that annoying salesman, but all you have to do is give us a call. We’ll be ready with the answers and any other help you need. We’ll help you, too, when the time comes to think about financing. We’ve got lots of experience and are really good at working directly with banks and other lenders to make sure our customers get really good deals with great terms. Low interest rates and low monthly payments you can easily cope with are our goal! And we’ll make it all even easier for you by handling most of the boring paperwork ourselves so you won’t have to mess with it. You also won’t have to worry about trying to figure out how you’ll go pick your car up when the day comes for you to drive it. We’ve got you covered there by bringing your car right to you – to your home, office, or most anywhere that’s convenient for you then. We really do our best to make sure our customers have the most laid-back, convenient leasing experience possible! If you have any questions for us, just give us a call at 347-897-5225! We’ll give you answers – and will love the chance to show you how we can save you a ton of money while offering you the biggest, most comprehensive inventory of vehicles to choose from, the most incredibly chillaxed car leasing experience possible, and great customer service. You’ll see!